So, it’s been a few weeks since my last reflection (I apologize for that)- a lot has happened…in fact, a lot is going on right now. To start, at the end of January I celebrated another birthday (glory to God for a new year! ), and spent that time with two of my best friends in England (definitely glory to God for that blessing!). During that trip, I reflected and communicated with God and had initially planned to blog about that humbling experience; however, the direction of my blog shifted due to some other things I have been preoccupied with. In the external world, I was introduced to some wonderful people within my professional circles (even professionally, iron still sharpens iron). I was blessed with opportunities for continual growth and learning development at my job. AND to top it off, I’d just wrapped up the final publishing details for my young adult book, Mirroring Effect. So, I can definitely say that things have been busy! Let me be frank: if it had been up to me, I would’ve quit back in January. I would’ve just nestled under my covers with my dog and let the days pass by. So what happened in January, you ask? My church did a 21-day Daniel fast and things got a little “touch and go” near the end. Remember when I spoke about the devil attacking when you’re obedient to God? Well, I don’t know what changed in the spiritual realm, but on Day 18, the devil made it clear he had declared war against all God’s people, and I just so happened to be the lucky contestant he called to “come on down.” With only 3 days left in the fast, it seemed all hell had broken loose! And it didn’t stop once the fast was over- that would’ve been great. No, it continued. In fact, it wasn’t until this past Friday night that I felt a new, positive shift. On Saturday, I grabbed my pen and pad; I had no choice but to write about this. Imagine trekking across the desert under the sun’s blistering rays. You’re exhausted from external factors (weather) and internally exhausted too (disposition). You feel you don’t have the energy to think; you feel you don’t have the energy to talk. In fact, you almost question your ability to continue. But you do. You press on not knowing where the next rest stop will be and you have no idea when you will get there. Although you try to just focus on putting one foot in front of the other, step after step, you eventually wonder, “How long?” Soon, you begin to plead for mercy; you plead for a rest stop. You plead for a breakthrough. Now, how’s that for imagery? Yeah, well the last few weeks have felt exactly like that. God still blesses me with a new day, which lets me know He isn’t through with me yet. And at the end of each day, I’m amazed that I even got through the day because I didn’t have any strength of my own to use. The only reason I got through the day- the only reason I continue to get through each day- is because of God’s strength and wonderful grace. And so, although the start of the day brings a feeling of weariness, the end of the day brings a feeling of humility. I came across this picture months ago, and recently it resonated with me again. 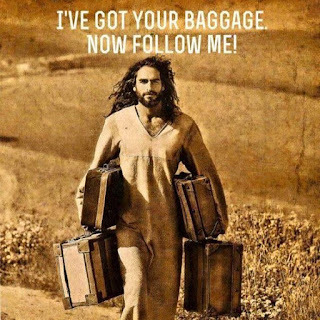 Every day, in order to continue my trek, I handed Jesus my baggage. Every day, sometimes every hour, I gave Him burden after burden and bag after bag, and no matter the weight, Jesus carried them as He walked with me. Side note: Don’t you just love how scripture supports everything God promises, and God faithfully proves Himself trustworthy??? But I digress. And so, I prayed for clarity and understanding. I prayed and asked God to allow me to see this situation through His eyes, and not through my limited perception. On Wednesday, one of my pastors gave a sermon so powerful, so moving, that I knew God had used him to answer my prayer. That night, my pastor spoke about the stages of Christian life, but specifically as they pertained to discipleship (sharing and spreading God’s word/encouraging people to seek a relationship with God through Christ Jesus). Now months ago, when I really started to work on my relationship with God, I prayed that He would use me to serve in His kingdom. I prayed that one day I would be able to encourage people to draw near to Christ and become part of God’s kingdom. I didn’t realize it at the time, but essentially I had asked God for the opportunity to disciple. So needless to say, my ears perked right up when the pastor spoke on this very topic. Stage 1: “Come and See” stage: (By a disciple/Calling/Curiosity, etc) You’re introduced to God through church or some form of worship. Stage 2: “Follow Me” stage: You declare Jesus as your Lord and Savior, receiving the gift of salvation, and thus beginning a spiritual relationship with God through Jesus (i.e. “baby” Christian). Stage 3: “Fishers of People (Worker)” stage: You make a conscious effort to seek and do God’s will by spending time with Him through Christ, allowing the Holy Spirit to guide you. You also begin to serve (work) in God’s kingdom by using your spiritual talents. Stage 4: “Becoming a Friend of God/Bearing Fruit (Disciple)” stage: You become the one to introduce someone to God. You share about the salvation of Christ, spread the Word to others, and encourage others to draw near to God. In his explanation of this season, my pastor reminded us that a gardener prunes a rosebush in order to help the bush grow. By cutting both good and bad roses from the bush, the gardener’s goal is that the bush will eventually mature into a healthy and beautiful bush. The more the gardener skillfully prunes, the more the bush grows, yielding even more roses. God wanted me to serve in His kingdom- He wants all of us to serve. Most importantly, He wants us to bear good fruit; He wants us to multiply (Matthew 25: 14-30; Matthew 28: 16-20; John 15:8). And so my pastor explained that God becomes the Gardener and allows seasons of pruning to occur in our lives. While pruning hurts (God’s shears are extremely sharp!) and the pruning seasons are often filled with sorrow and suffering, we must go through these seasons in order to become fruitful. God wants to prepare us for the harvest season. And so, He will snip off pieces of ourselves- a little here, a lot there- so that we multiple His fruits (His kingdom). I can recall a few weeks ago I had read a quote that said God might not be changing the things around you because He’s changing the things within you. I realized that God had chosen this time as my season of waiting because it was His season of pruning. And so, after bible study, I spent the next 2 days marinating over what I had learned. On Friday night, I decided to make a conscious effort not to analyze why Jesus leads me down the paths He does. In that decision, I relinquished yet another burden, another portion of my need for control. Instantly, I felt better. As I reflected over these last few months through new eyes and understanding, I also discovered that I had unfortunately made a lot of mistakes. I had spent a lot of time wrestling with God, being stubborn and (incorrectly) overanalyzing everything, instead of just using this season to soak up opportunities to learn and grow spiritually. If you find yourself in a similar season, I implore you…I encourage you NOT to repeat my mistakes! Please learn from them. If you are in a season of waiting and/or in the midst of great sorrow and suffering, know that God is pruning you. He’s shaping you so that you will become fruitful. I don’t know how long this particular pruning season will last, but I choose to use the remainder of this season drawing even closer to God. I pray that you will do the same. Because if we just continue… if we just push through this season, we will come out of this desert and enter into a land filled with “milk and honey” (Exodus 3:17). We will reach Stage 4. We will bear good fruit. I need just a little more Jesus. (I need just a little more Jesus). Hey, I need just a little more Jesus. To help me along my way!